Soft Washing your asphalt shingles is a relatively little known practice among homeowners until they have been directly affected by a dirty roof. If your roof has unsightly black streaks, moss, and visible algae on it then it’s likely you need to learn more about the Soft Washing process. 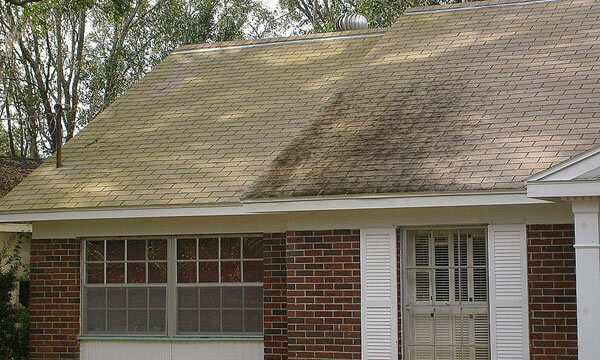 It will save the life of your roof and restore it’s appearance to an almost new condition. If you have a dirty asphalt shingle roof or need to deal with a dirty roof on a property you might be managing then Soft Washing is the only way to effectively clean asphalt shingles as recommended by the asphalt roofing manufacturers association (ARMA). So What Exactly Is Soft Washing? First it involves a thorough visual and walk around inspection of your dirty roof to take note of any specific areas that will need attention. Then we’ll spray a specially formulated detergent onto your entire asphalt shingle roof. This specialized detergent will fully kill all of the mold, algae and lichen’s that are actually feeding on your shingles. After the detergent has done it’s work we carefully rinse it off your roof using specialized “Soft Washing” equipment that will gently clean your roof without harming your asphalt shingles. What Will Soft Washing Your Roof Do For You? It’s going to make your home or building look better for one. Some homeowners can receive a letter from their insurance carrier warning them of a cancelled policy if they don’t take care of their dirty roof problem because it’s costing the insurance companies a lot of money in roofing claims from owner neglect. If you’re looking to sell your home, or you manage rental properties or buildings then Soft Washing the roof is a great, affordable way to improve the exterior curb appeal of your properties. Dirty-Roof.Com works directly with Real Estate Agents and Property Managers to provide hassle free and affordable roof cleaning solutions for their listings and managed properties. Can You Soft Wash A Roof On Your Own? Sure, you probably could but when you see how efficient we are at it, and how thorough of a job we do, you’ll never want to even think about doing it yourself again. It’s a dangerous job climbing around on a roof that’s being sprayed with special cleaning agents and it also takes an experienced hand to operate the equipment required. If you’d like to have your Long Island, NY roof soft washed by the professionals then you need to give Dirty-Roof.Com a call today.